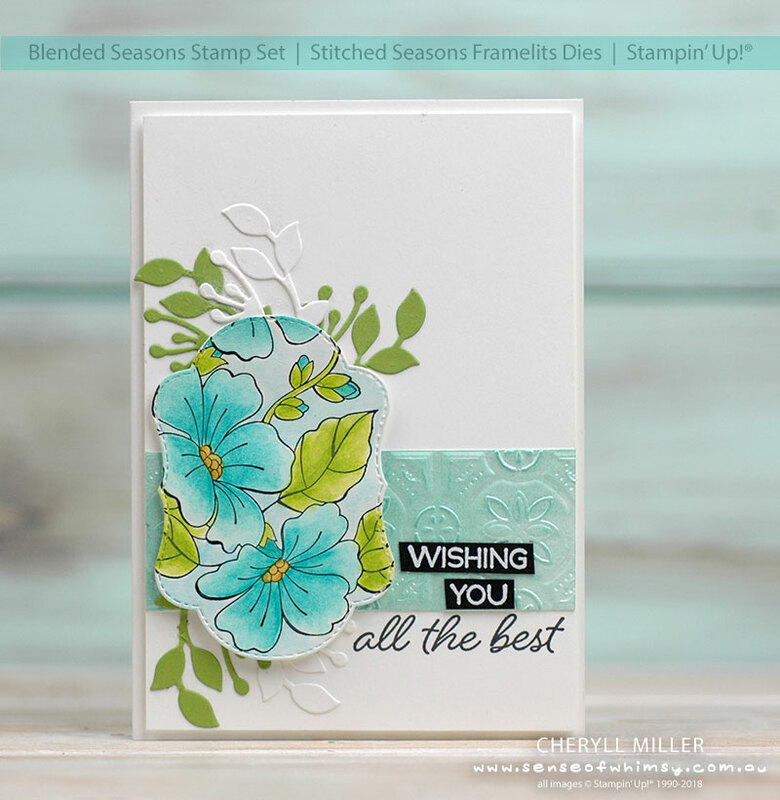 Blended Seasons Stamp Set and Stitched Seasons Framelits Dies …. Limited edition product! Welcome to my blog and the Go For Greece Blog Hop for July. We are a group of demonstrators in a training/mentoring group call “Go For Greece”, organised and headed up by the fabulous Kylie Bertucci. As the Stampin’ Up! year is coming to an end, I can reflect on how much I have learned from this amazing group. And on how much I am looking forward to the next year with this wonderful supportive community. Jump in and get this bundle quickly as it will no longer be available after 31st August. 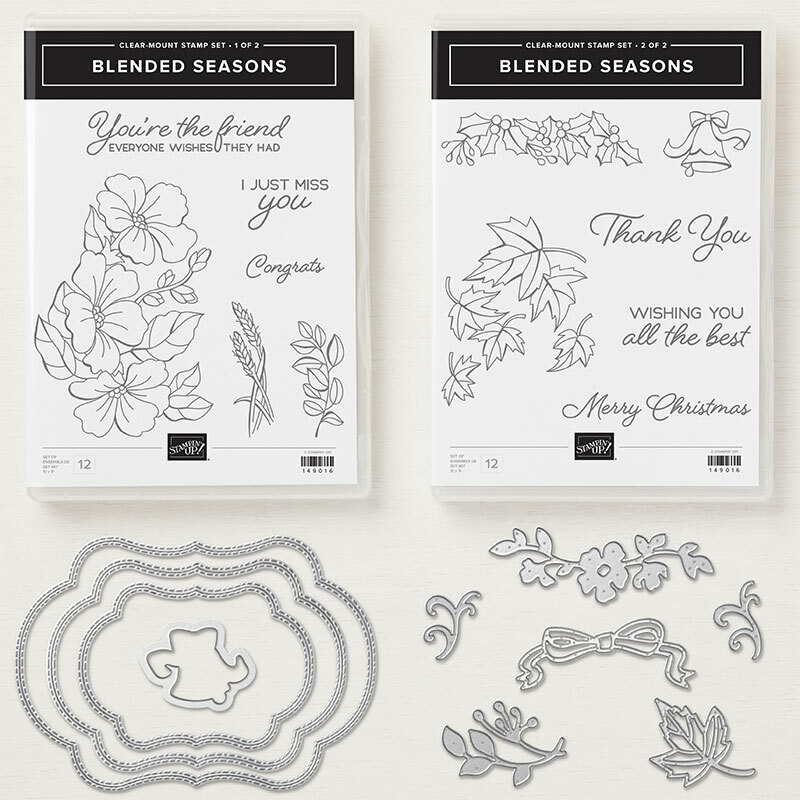 Bundle includes Blended Seasons Stamp Set and Stitched Seasons Framelits Dies. Available until 31st August or while stocks last. Click image to order. 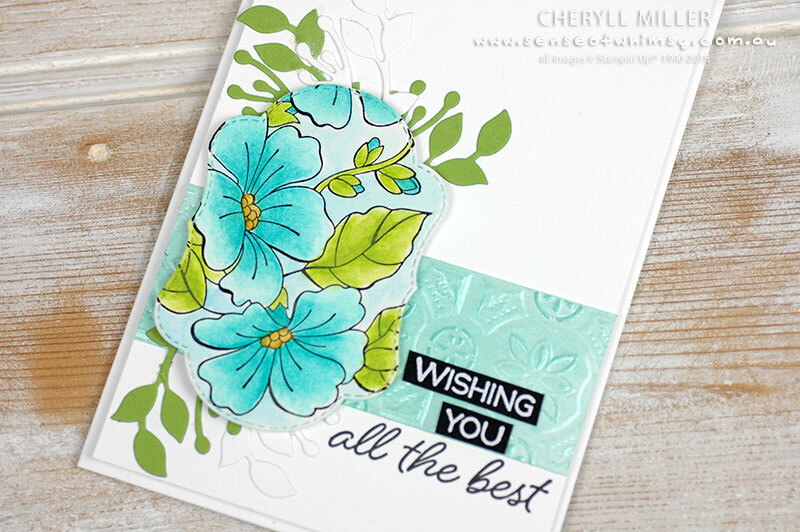 For this card, I have stamped the large floral image onto the smallest stitched label die. Obviously, this image doesn’t fit on that die, however just having part of the image on the label really accentuates the label shape. I think it sort of looks like a panel of patterned paper that I have cut the label out of. I used the Watercolour Pencils (Set No 2 – limited edition in August) to colour this image, blending the colours with an Aqua Painter. I added a very pale wash of colour in the background to highlight the look of patterned paper cut out with the label die. I also wanted to sneak in some new product I have just received and am very excited about. The Tin Tile embossing folder and Frost White Shimmer Paint. Join me for my facebook live tonight on my facebook group page, open to everyone, to see how I achieved this lovely strip of shimmery gorgeousness. Using Shimmery White Cardstock for Watercolouring – Shimmery White cardstock is wonderfully smooth, which makes for crisp stamped images. And it is also fabulous for watercolouring, especially with the Watercolour Pencils. For a visual demonstration of this, check out my facebook live tonight. 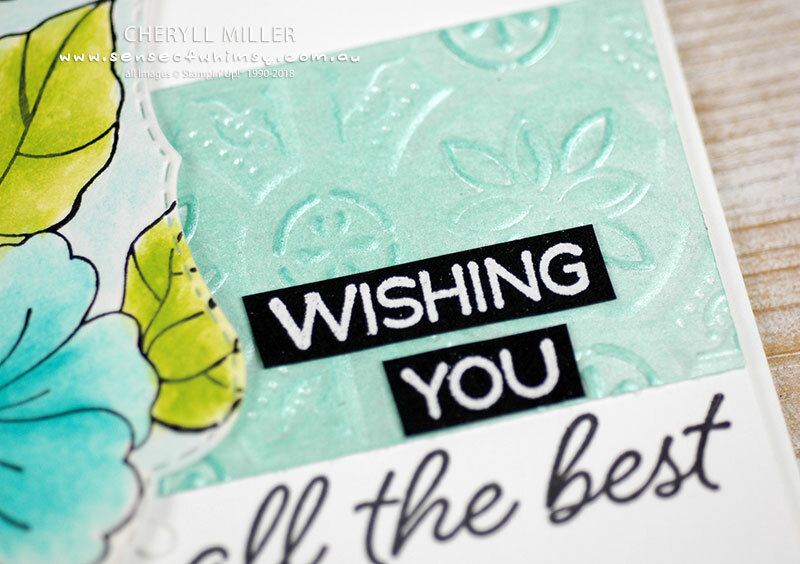 Use Greeting Images in different ways – The greeting I wanted to use for this card, “Wishing You All The Best” from Blended Seasons stamp set, didn’t quite fit on the card the way I wanted it to. So I masked the “Wishing You” part of the stamp before stamping the image onto the card front. Then I white embossed the greeting on black card and just trimmed out the “Wishing You” to add to the card and complete the greeting. 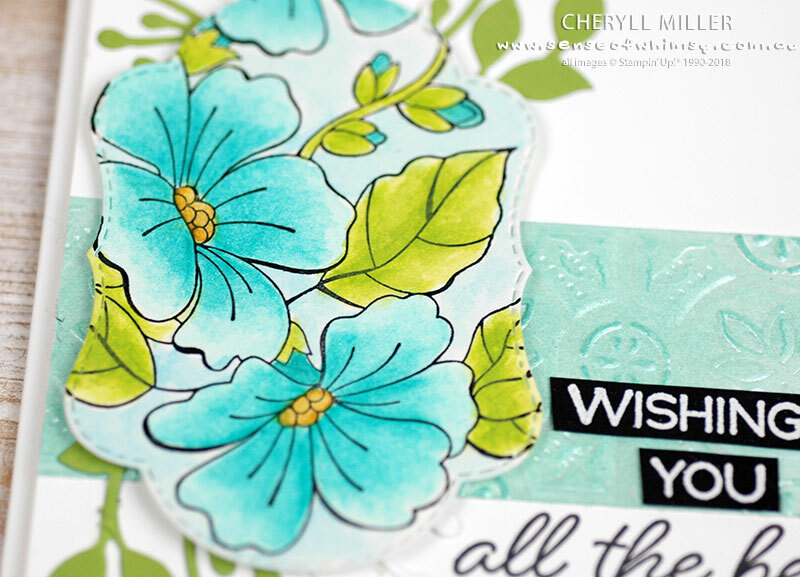 Tone on Tone Die Cuts – This card was starting to look a little busy, so to tone it down a little, I used some white die cut leaves with the Granny Apple Green leaves. Having the white die cut leaves on the white background gives a more subtle textural effect. 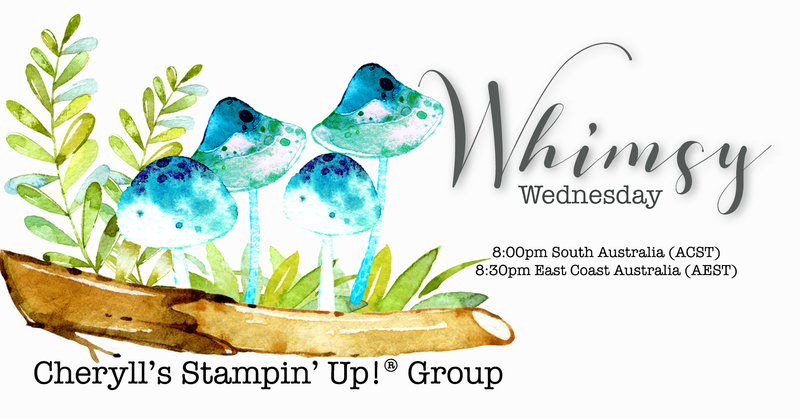 A reminder that you can see this created live on facebook tonight on my Stampin’ Up! Group facebook page. Click here to go to the event and then click “going” to receive a reminder at the correct time. 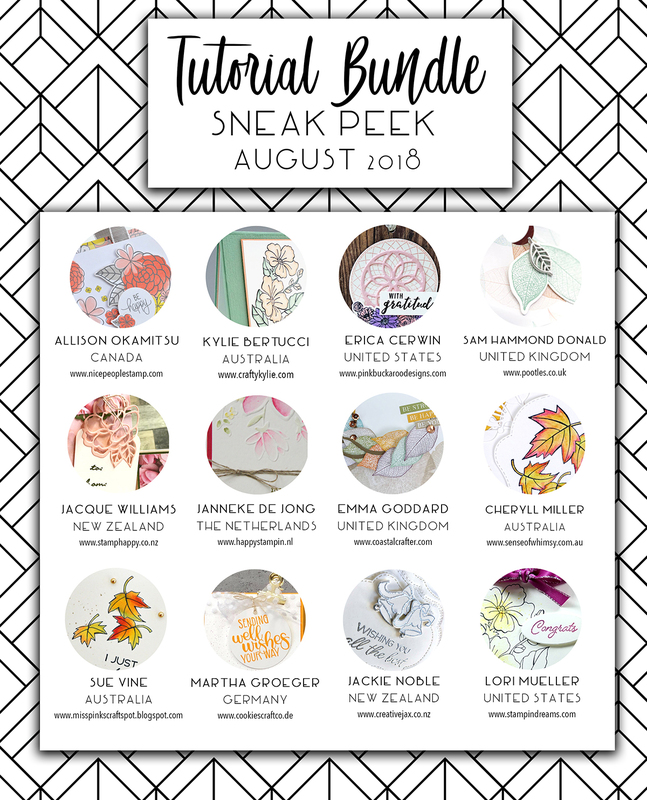 The Go For Greece girls are all wonderful and inspiring paper artists … set yourself up with your morning cuppa and hop around and check out what they all have to offer. Don’t forget to leave some comment love .. we all work hard to create inspirational projects and really appreciate every comment. The Bonus Days Promotion is happening during August. Yep, that’s right … for every $90 you purchase (in one order) you will receive a $9 Bonus Voucher to spend during September. Which means if you purchase the Blended Season Bundle, you will get $9 to spend during September!! Bonus extras when you purchase the Blended Season Bundle in August. 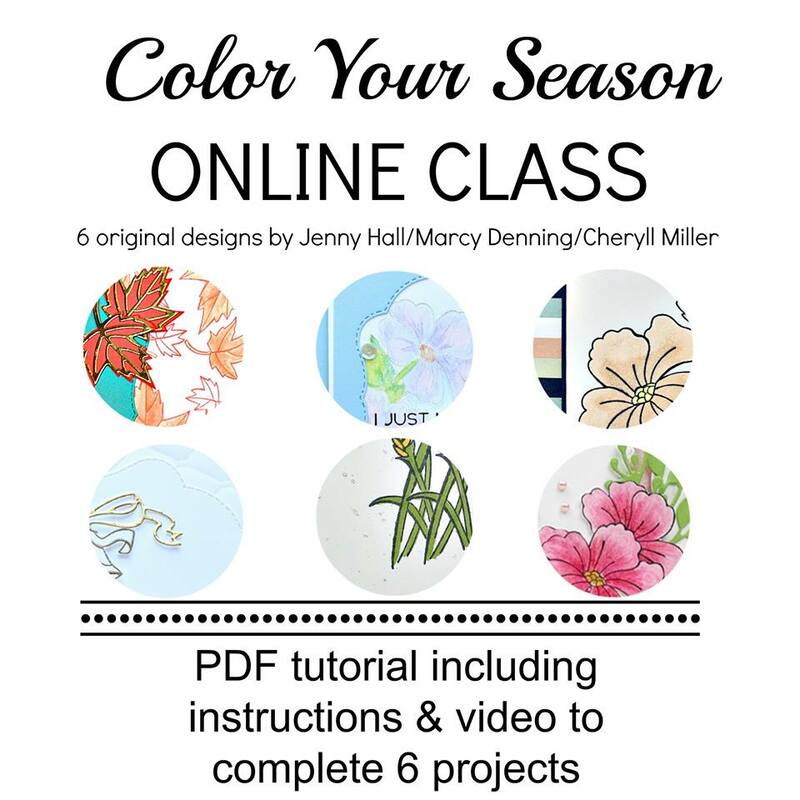 Not only will you get your $9 Bonus Voucher when purchasing the Blended Season Bundle from me, you will also receive my Colourful Seasons Online Class for free … that is six PDF tutorials and videos using these products, AND you will also get the six card kits of cardstock and embellishments so you can start creating right away. Are you a demonstrator or not in Australia? You can purchase the Online Class for AU$20 here. (Scroll down past the black bar at the top of the page). All measurements are in both metric and imperial. This is a great resource for classes and the videos make it so easy to re-create these lovely projects. Check out all my Online Classes and Tutorial Bundles here. 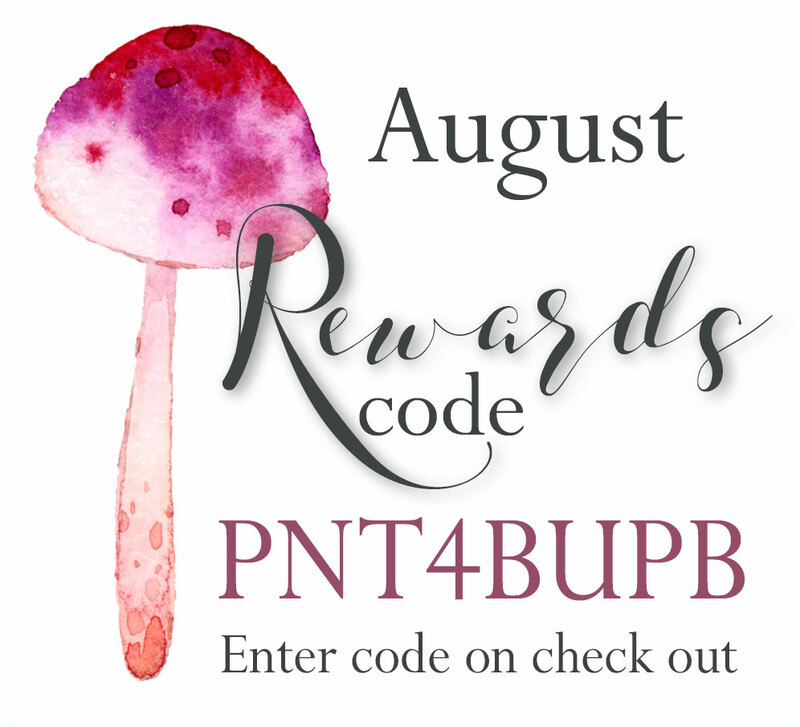 Happy shopping … here is the Rewards Code for August. Add this to your order on check out and receive an extra little something from me at the end of the month. So gorgeous and elegant. That piece of embossed card just adds something special. Love! Hello, Cheryl, hey great minds think a like haha. First we remember at a short notice and then we use the same stamp set and stamped image. I love the colours, they are so crisp and fresh. Very pretty, gives the Spring / Summer look. Seeing the Tin Tile Embossing Folder as a band on the card, gives the card a huge textile design like no other. With the softness of colour along with the Tin Tile look makes your card the Yesteryear feel. Gorgeous card!! Love the coloring on the flowers, thanks for sharing!!! Stunning card Cheryll! Will have to try to catch you live tonight. WOW! This is beautiful and in my favourite colours. LOVE! I love how you have used the new tin tile TIEF, that is awesome! So elegant, Cheryll. I love everything about this gorgeous card – beautiful!